As I was watching Back to the Future, Part II for about the 573rd time over the weekend, I started to wonder — what would the future-married-version-of-me say to the present-single-version-of-me? Unfortunately, I can’t just jump into Doc Brown’s time-traveling DeLorean, go 30 years into the future and ask myself for some advice (And considering that might cause a paradox that could ultimately unravel the very fabric of the space-time continuum, it might not be a good idea anyway). So I did the next best thing: I asked a bunch of married people what they would tell their single selves if they could travel back in time and give themselves one piece of advice. I asked married people from a wide variety of vocations and backgrounds, ranging from pastors and teachers to firefighters and career advisors. Some of them have been married for decades, others for just a few months. But they all have this in common — they honor God and their spouse in their marriages and they have a positive impact on the people they come in contact with. They have the kind of marriages I hope to one day be in. We often look at singleness as this desert that we need to escape from as soon as possible, and that finding ‘The One’ is the water that will quench our thirsts, solve all of our problems and give us the happy ending that cues the credits. The truth is that mindset wastes precious time during our single years. I burned some valuable time in the past playing the woe-is-me-for-being-alone game instead of using that time to get to know myself better, build character, serve others and learn from people who have been there and done that. 1. "Listen to God. Listen to others. You don't know everything." 2. "Don't think so much about yourself." 3. "If someone cannot see your value, move on. And don't question why they couldn't see your value. It was just not meant to be. God has something better for you!" 4. "Take your time, don't rush things." 5. "If you have a bad feeling about something or someone, don't pursue it." 6. "Don't think you can get physical in a relationship without getting emotionally attached." 7. "Stop trying to change the person you plan on marrying or dating." 8. “Understand that when you get involved physically in a relationship, you give away a piece of your heart. If you really want to be a man of God, keep moving forward in your relationship with Christ and once in a while pop your head up and see who's with you. Don't try so hard to make things happen." 9. "Don't define yourself by what the world says, but by what God says about you and begin praying for your future spouse now." 10. “You are worth more than you think you are." 11. "Be more content while being single. I think for too long you've been looking for someone else to be happy with. Not to mention that for too long you were looking for the 'right person' in the wrong places." 12. "Understand that success is fulfilling God's purpose for your life." 13. "Don't let things distract you from what you put your mind to. Finish what you start." 14. "When you date somebody, that's when you should keep your eyes open — looking for things about that person that you like and don't like. Be willing to talk things out while you're dating, learning how to communicate and address issues during the dating stage before you get married." 15. "Get plugged into a church and serve others." 16. "Don't marry someone who doesn't share your faith and values." 17. "Don't worry about the future and enjoy singleness because it is unique and there are so many benefits to that season. There are many benefits to marriage, but you will miss some of the benefits of being single." 18. "Give your life to seeking God and doing His work in the world around you." 19. "Enjoy the flexibility of single life. Don't be so desperate to find somebody that you compromise too much." 20. "Don't get so hung up on looks. Everybody gets older but personalities rarely change. Find someone you love to spend time with, not just someone you like to look at." 21. “Let God guide you, don’t try and guide God. Stop fighting tooth-and-nail for your own will instead of God’s will; it will only lead to frustration, bitterness and pain." 22. “Go take Financial Peace University and get your finances in order now. Don't have any credit cards and no matter what, don't go into a single penny of debt. Start investing in your future immediately by saving money every month and by opening a money market account. Put something every paycheck into it. Even if its just $50. Be ruthless and stick with it!" 23. "Hang around the right crowd, people that will help lead you to success." 24. "Slow it down, youngin'! Life is so fragile, and time so valuable. Don't always be in such a rush to get to the next level. Enjoy where God has you now. There is purpose in the life you live now. Take time to nurture your relationships and plan your future accomplishments. It's not about how many steps you take. It is the quality of each step you take that makes the difference. Contentment is only found in Christ." 25. "Stop looking for the right person and start working on becoming the right person." 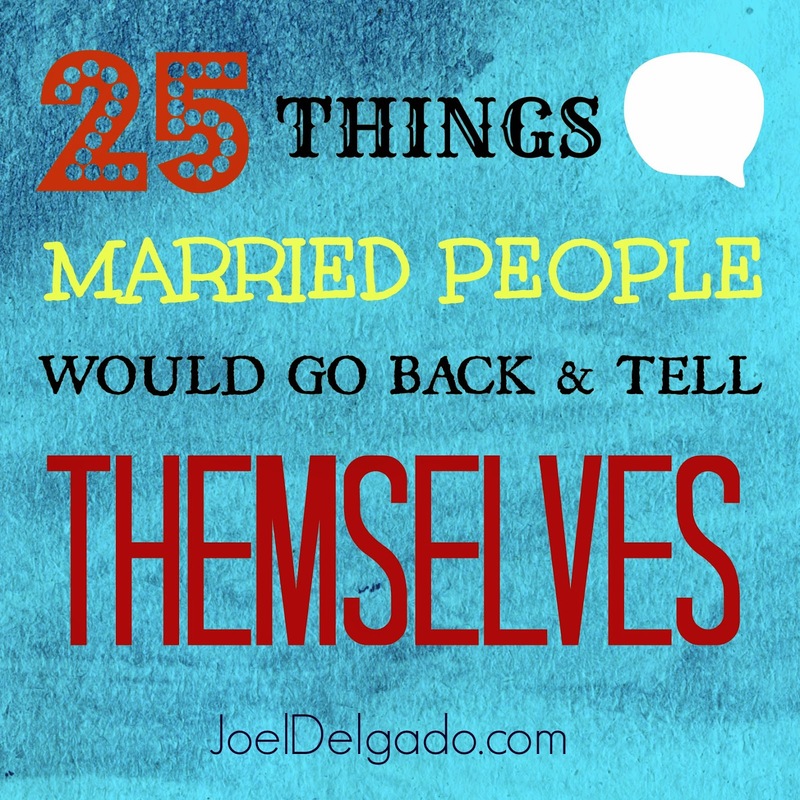 If you're married, what would you go back and say to your single self? If you're single, who in your life can you look up to for valuable advice? "Don't think so much about yourself" is probably the best piece of advice! If you really want to build strong, positive and long-lasting relationships, let your partner know that he/she is a major priority for you. Put comfort, well-being and happiness of the person you’re with at an equal level to your own. Great list! Needed to hear that!